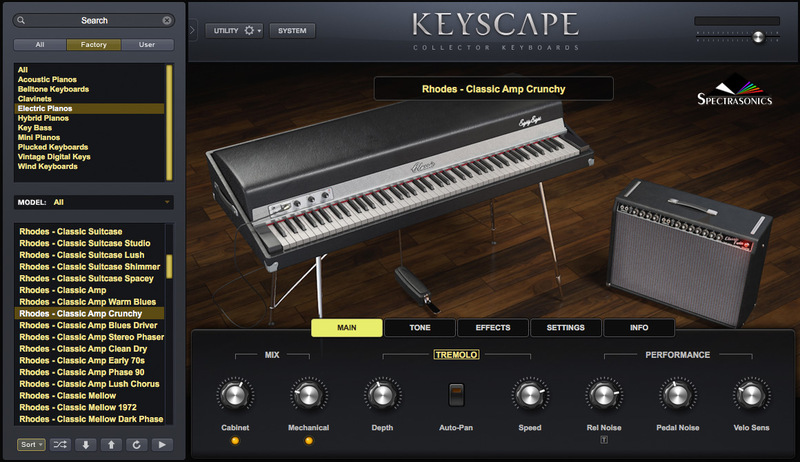 Played by just about any keyboardist you can think of in R&B, jazz, hip-hop, and rock, the classic Fender Rhodes® Electric Piano is one of the foundational instruments of popular music. With over 250,000 instruments produced, a major culture has grown up around the instrument. The Rhodes® piano action causes its hammers to strike tines (tuned metal rods) which are attached to more substantial metal tonebars for sustain. The sound is amplified by electro-magnetic pickups routed to an active pre-amp in the Suitcase models. 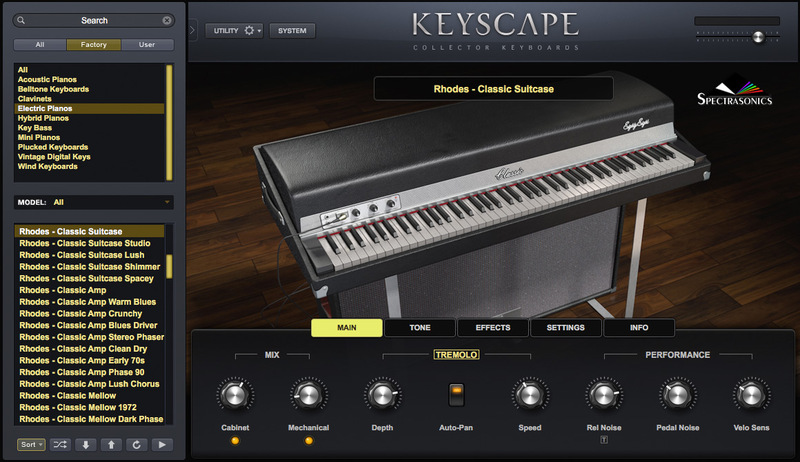 The Rhodes® sound is also one of the most frequently sampled and modeled instruments in electric keyboards. However, as many keyboardists will tell you…nobody seems to nail it! 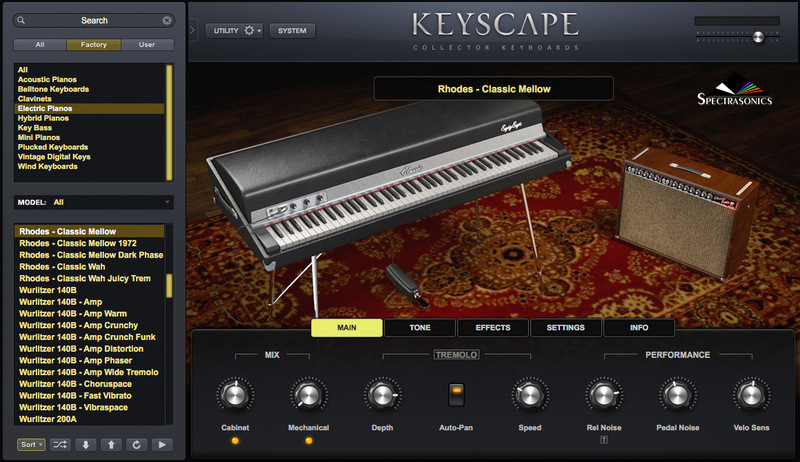 Because of this, we launched a major, decade-long research project to achieve the ultimate range of Rhodes® sounds for Keyscape. 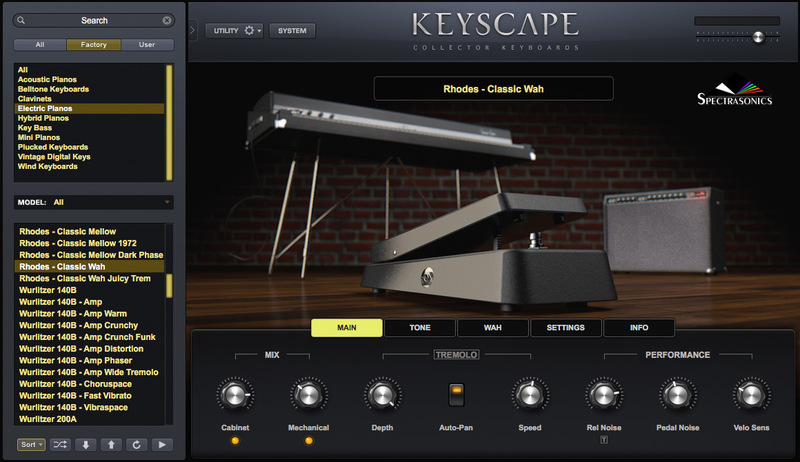 Since the Rhodes® comes from the Southern California area – where Spectrasonics is also based – this gave us special access to the top experts in the world. This is critically important with electro-mechanical instruments, since every era and even each individual Rhodes® sounds markedly different. There are a few truly extraordinary sounding instruments out there and we set out to rebuild the ultimate version of the classic ‘70s Fender Rhodes®. While numerous models were produced between 1965 and 1984, the consensus is that the early ‘70s Mark I Suitcase with wood keys and Peterson electronics is the ideal specimen. Our amazing-sounding instrument was carefully restored and rebuilt by renowned Los Angeles keyboard techs at Ken Rich Sound Services. Capturing that “holy grail” tone (along with all the funky releases and mechanical noises) became our passion. We also painstakingly circuit-modeled all the classic amps and effects used with these vintage instruments in the software. The end result is really something special and we are thrilled that this classic is featured in all its glory as part of Keyscape!